This information was presented at an event hosted by the Bloom Collective on September 8 and is re-posted here with the help of several Bloom Collective members. The presentation began with the premise that in order for institutional or systemic change to take place in any community, people must have a clear understanding of who has power, both economic and political power. 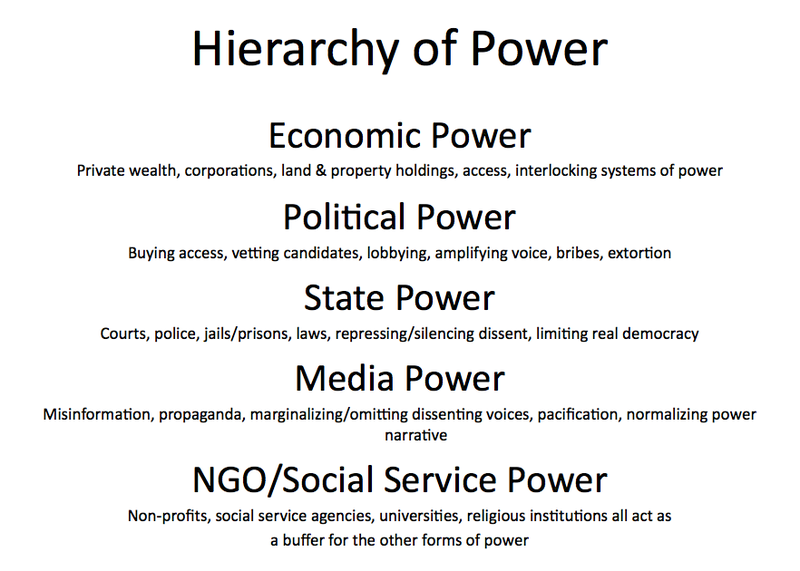 The first slide shared was on understanding the Hierarchy of Power, which is included here. The hierarchy of power believes that private economic power is the strongest form of power and that this sector of power uses political power to control state power. What is meant by political power is the idea to influence state policy through money and political leverage, which is often manifested in the relationships that private power has, the amount of assets and the associations and boards that it occupies. Once the idea of a hierarchy of power was established, there was a discussion of who represented private power in Grand Rapids. There certainly are large, global corporations that have a presence in Grand Rapids, such as JP Morgan Chase Bank, AT&T, Coca Cola, Veolia and General Motors. These companies have power in that they can demand tax breaks and subsidies for setting up shop in the area, but they rarely influence local policy on a more regular basis. 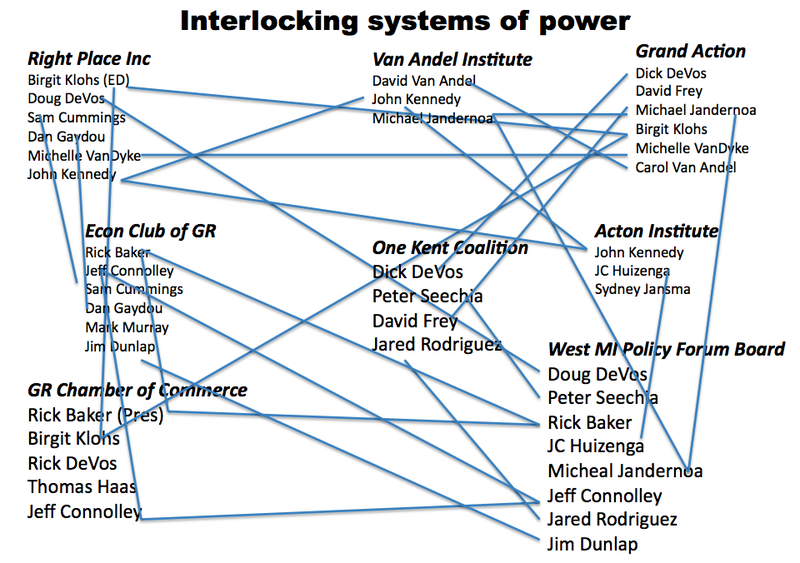 The families, individuals and associations that were identified as having the real power in this community includes (but is not limited to) the following: DeVos, Meijer, Van Andel, Cook, Seechia, Michael Jandernoa, John Kennedy, David Frey, Sam Cummings, Huntington, the GR Chamber of Commerce, The Right Place Inc., The Econ Club of Grand Rapids, the West Michigan Policy Forum, Grand Action and the Downtown Development Authority (DDA). These are the families and entities that through individual wealth or collaboration too often dictate the outcome of policies, economic development and major cultural dynamics that impact the entire community. The easiest example is the DeVos Family. Their collective wealth and assets is astounding. You can see here how much they own and can get a more detailed listing at this link. In addition to the wealth & assets that the DeVos Family holds, they influence policy through direct contributions to political parties/candidates or campaigns. According to data provided by the Center for Responsible Politics, we determined that the DeVos family had collective given over half a million dollars in the 2012 election cycle by July. 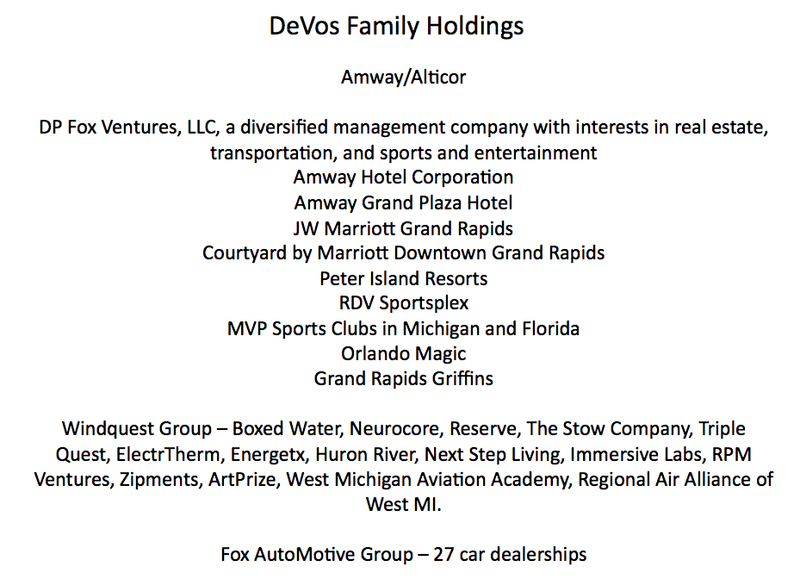 Other examples of members of the DeVos family influencing policy are the recent donation of $250,000 by Richard DeVos to Wisconsin Gov. Scott Walker in his bid to defeat a recall campaign and a $500,000 donation by Doug DeVos to the National Organization for Marriage (NOM), a lead organization that fights marriage equality across the country. On a more local level, the DeVos family has given money to influence the politics of local universities and colleges, religious institutions, hospitals and non-profits. In addition to the power that individual families have because of their vast amount of wealth, they also have power through formal associations. If one were to look at who sits on the boards of entities like the Grand Rapids Chamber of Commerce, Grand Action, the Econ Club of Grand Rapids, the West Michigan Policy Forum and the Right Place Inc., one can see the wealthiest and most powerful people occupying those boards. One can also begin to see that certain names appear over and over again, thus creating what could be called interlocking systems of power. Here is a graph to illustrate these interlocking systems in Grand Rapids. Understanding that private economic and political power is greater than state power, we can then see how the state more often than not operates to maintain the social stratification created by the local elites. Through police, the courts and the jail, the state will deal with disproportionately poor and minority communities by putting them in the Prison Industrial Complex. This is not to say that the state does no “good,” such as libraries and public transportation, but the good/bad binary that has been created by the power structure doesn’t allow us to see how power functions. Of course, the state does some “good,” but the point here is that its primary function is to act on behalf of private power and not allow the masses to really have a say in social and economic policies. The media also plays the same role, since the media is part of the power structure, based on who owns them. However, even most reporters will not question the power structure, since they have either internalized the values of the system or engage in self-censorship in order to protect their job. Very little local media is owned locally and when they do report on those with power, the news is often bias, framed in the good/bad binary and sometimes the news media acts as sort of a PR outlet for power. This brings us to the last level in the hierarchy of power, the NGO, Social Services sector. More often than not what one sees with non-profit organizations and social services, entities that are dealing with the consequences of private power’s quest for more power – poverty, various forms of discrimination, poor health, destruction of the environment – is that these NGOs will not question the reasons why people are poor, are suffering from bad health or are the victims of discrimination and oppression. 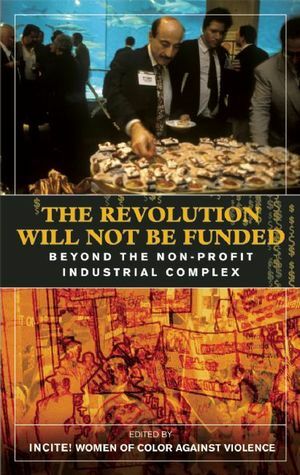 Radical sociologists identify the social service and non-profit sector as the first line of defense against social uprisings. If your organization or agency can provide charitable assistance to people, then they are less likely to direct their rage towards systems of power. In a sense, much of the social service and non-profit world acts as a buffer between the disenfranchised masses and the power elite or as the Occupy Movement would call them, the 1%. This is exactly why virtually all those individuals and families who make up the 1% in Grand Rapids have their own foundations. Foundations are first and foremost a way to put one’s wealth into a non-taxable status, but it also serves as a way to create an illusion of concern, redirect attention away from social inequality and to engage in population management. The power structure often gives money to programs that serve the “needy” as a way to guarantee that those most disenfranchised not only will not rise up against the power structure, but will actually come to see them as people they admire. We can see this all throughout West Michigan, where the DeVos, Prince, Meijer and Van Andel families are viewed with great admiration. The fact that working class people will speak highly of the local power structure is an amazing feat of propaganda that would make Joseph Goebbels blush. The discussion at the Bloom Collective ended with looking at the function of ArtPrize within a local power analysis. People were able to deconstruct the role this art event played within that hierarchy of power and who the real beneficiaries were of the annual event. The only wealthy people i admire are the ones who truly want to help with no gain for themselves. The wealthy around here only do it to look good, certainly not because they truly want to help others. One of your best articles, I wish I could have made it to that meeting. lookn good, i waish i couldve attended but the am quasi-incarcerated in Nebraska. It wasn’t all Jeff. Please give credit where credit is due. Dave never refers to any one person. Just sayin, if you’re going to nit pick, you should probably pay attention to details. I know, right? The problem is totally 100% with me. I’m definitely nit-picking, not the one who is questioning to whom the word “your” is referring. It’s not like there is an ongoing problem with this or anything. Nope, definitely not. The fact that you continually choose to address your grievances via trolling is very telling. Additionally, this is a tired and irrelevant argument, especially when coming from an outsider. You were not involved in putting this piece together, so you criticisms in how it was presented (or rather, how people are trying to compliment it, an act you seem incapable of) are pretty weak. Once again, do you have anything to say about the content on this page, or are you just hear to try and sew dissent?